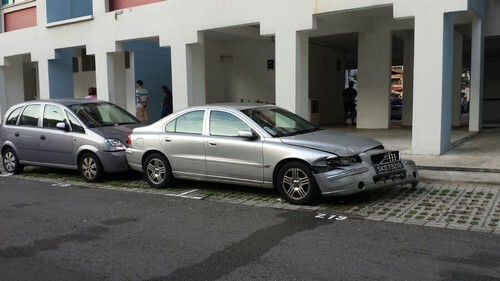 Some of the damaged vehicles in the carpark in McNair Road yesterday. The driver of a black Toyota was said to have lost control and sparked the series of collisions. 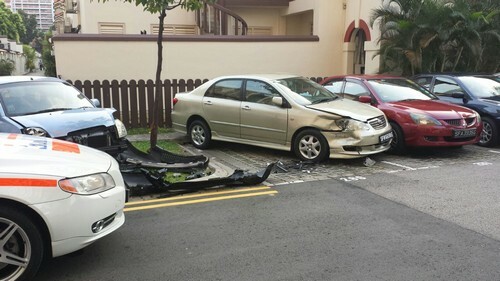 A black seven-seater Toyota left a trail of destruction in a carpark in McNair Road yesterday morning after its driver lost control and sparked a series of collisions that damaged eight cars, including itself. 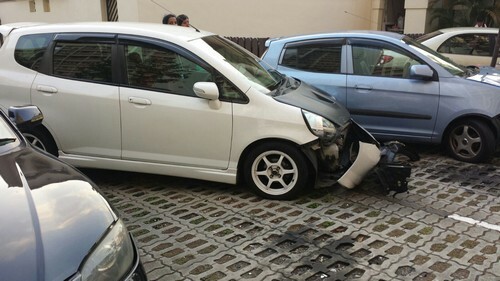 The Toyota was trying to exit the carpark when it lunged to its right and hit a Volvo, which crashed into an Opel parked behind it. Half of the Volvo's bumper was ripped off. 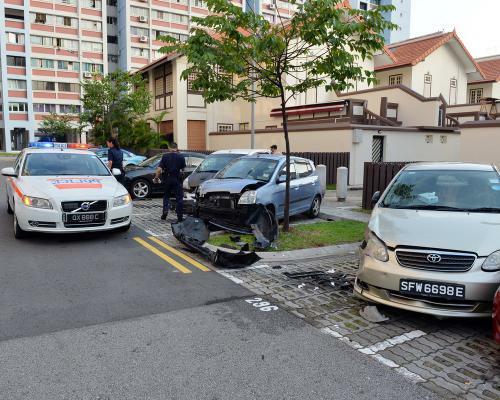 The Toyota then veered wildly to its left and hit three more cars, shearing off the licence plate of a Mazda and tearing off the bumper of a Kia and a Honda. The black Toyota also hit another Toyota, which crashed into a Mitsubishi beside it. 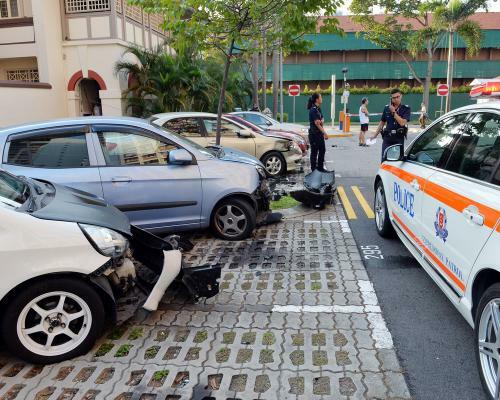 Police were called in at about 6.30am and arrested a 22-year-old woman suspected to be behind the wheel of the black Toyota. Police investigations are ongoing. 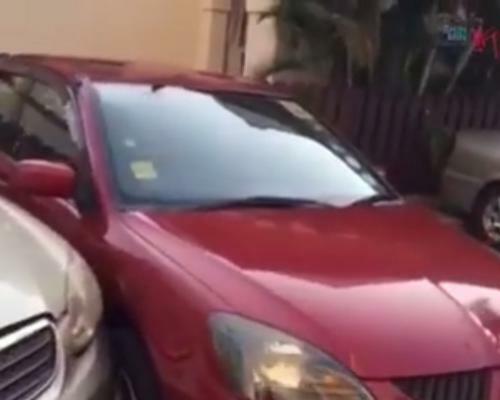 Chinese paper Shin Min Daily News reported that the woman was in the driver's seat and pleaded with one of the owners of the damaged cars to not report the matter. 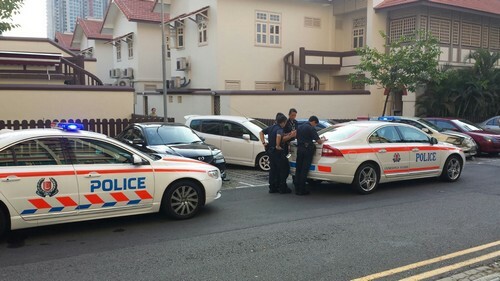 But when The Straits Times (ST) spoke to her outside her home after she returned from the police station yesterday, the woman, who gave her name only as Ms Vila, said the driver was not her but a friend. 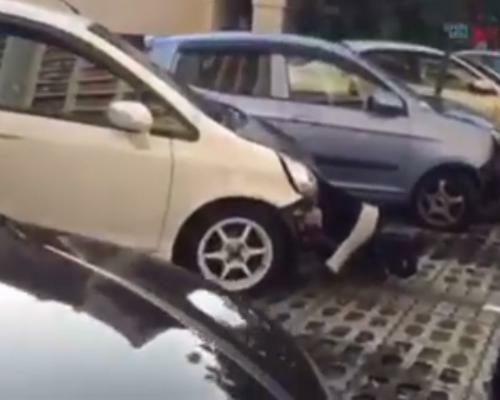 A 22-year-old woman has been arrested in connection to a bizarre accident at a carpark at Block 122 McNair Road in Balestier this morning. 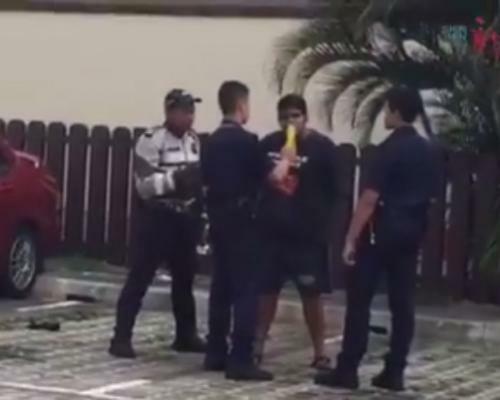 According to The Straits Times, she was apprehended for suspected drink driving. 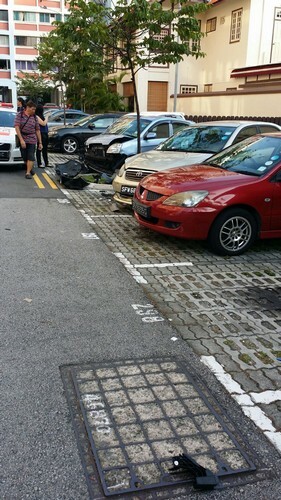 Photos sent by a reader, Mr Peter, showed several parked cars facing an awkward angle in the accident's aftermath. Eight vehicles were understood to have been involved. 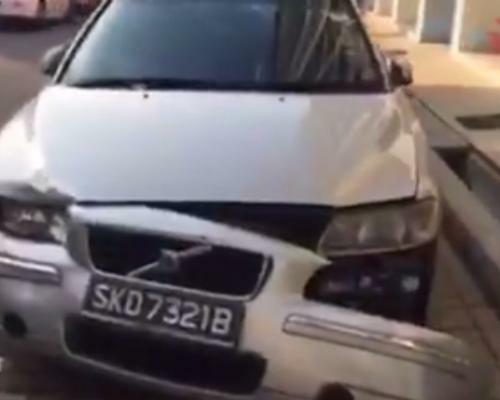 The front bumpers on at least two cars had fallen off, while the front and sides of other cars appeared badly smashed up. 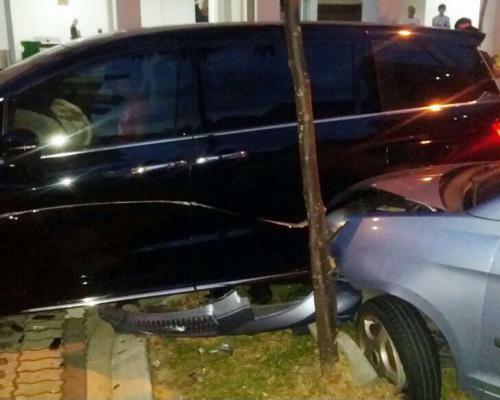 According to Shin Min Daily News, she had lost control of her car and collided into seven other parked cars. She was seen pleading for the other car owners to let the matter go, while her boyfriend drove away from the scene. It is understood she was given a breathalyser test. A police spokesman said it was alerted to the incident at 6.29am. "I was not driving the car. It was my friend. 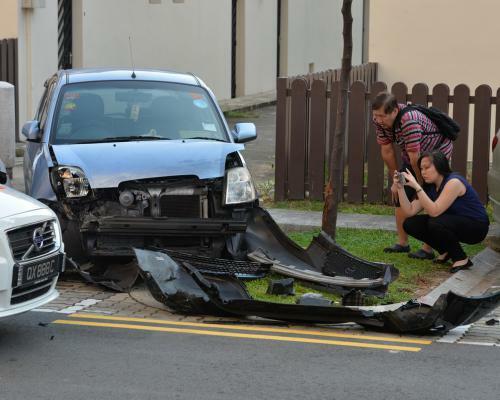 He drove off after the accident happened," said the resident of McNair Road, near Serangoon Road. Ms Vila, who does not have a driving licence, said the car belongs to her friend, who also had his statement taken by the police. Ms Vila said she was hanging out with a group of friends in the neighbourhood through the night. 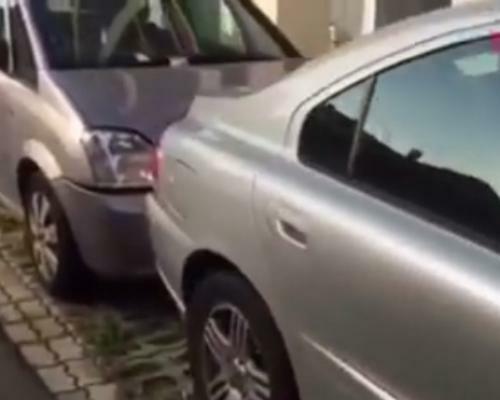 The accident occurred as they were about to drive out of the estate. ST understands the group had been drinking alcohol before the accident. 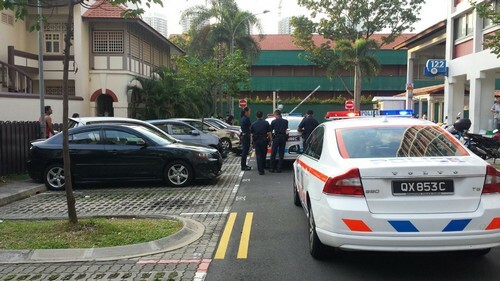 Shin Min ran a photo showing Ms Vila doing a breathalyser test in front of police officers. When ST asked her if she had been drinking, she shook her head and did not say more. 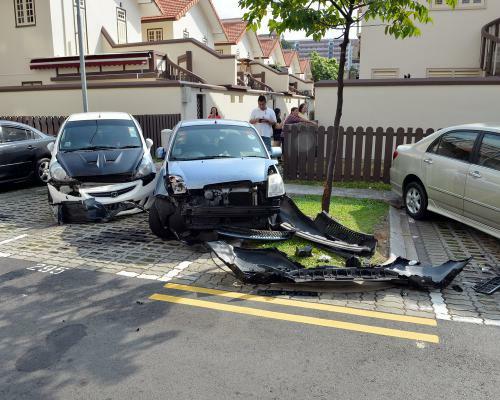 Housewife Gowri Govind, 40, who lives nearby, said she was helping her son get ready for school when she heard a noise at about 6.30am and saw from her living room window that seven cars had been left damaged by the black Toyota. 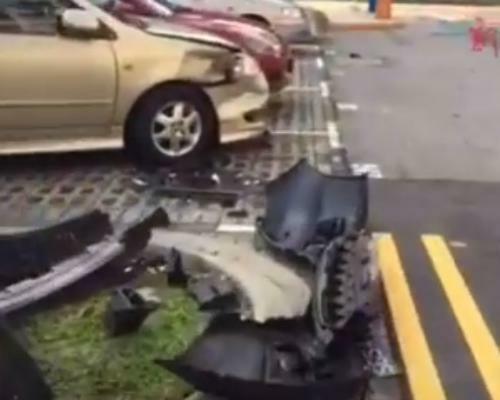 "It was a very loud sound of metal crashing. I looked out and saw cars damaged on both sides. There was a black Toyota and two women and a man were standing outside it." The Toyota left the scene after the accident, she said. 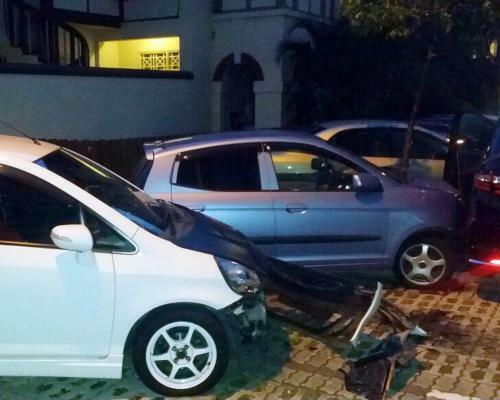 The owners of the damaged cars and several residents started gathering at the carpark shortly afterwards. One of them was Mr Colin Lim, 47. The front of his Mazda was dented, and missing its licence plate. 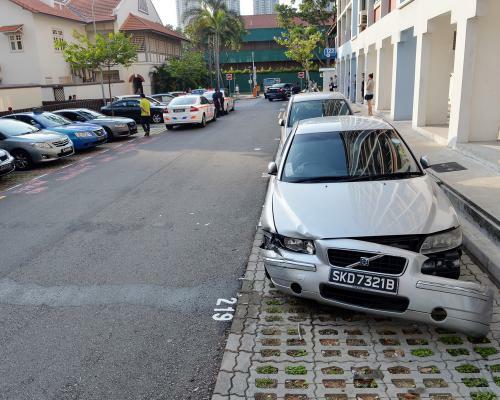 But Mr Lim, who works in a petrochemical firm, said he was lucky. 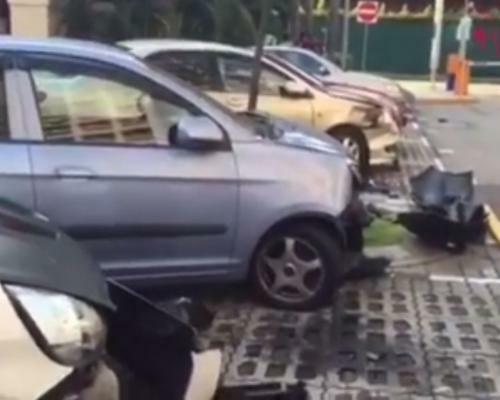 "The accident involved seven cars, and most were quite badly damaged. At least I can still drive my car. I'd be upset if I can't even drive it." He said he intends to fix just the licence plate as he plans to scrap the car. "Of course, if this was a brand new car, I'd feel the heartache," he said.